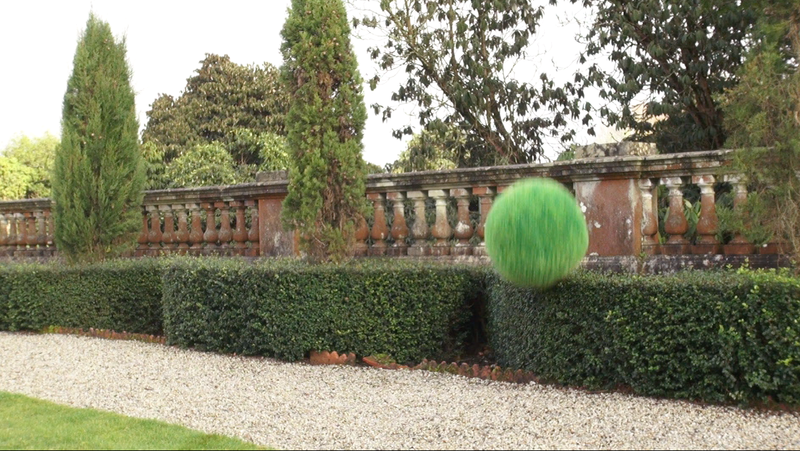 Rosanna Catterall’s video work Topiary Exploration charts the pushing, moving and rolling of a fake topiary ball through a landscaped and considered garden. The ball is the protagonist of this short drama, searching in vain for a setting to sate its desires and aspirations. Perhaps this character is happy in its plastic self, playful in its failure, scrapping in the dirt. Rosanna uses digital video projections which challenge the usual 16:9 aspect ratio. These project on to unusual screens, together with objects and sculptures, Rosanna’s work contemplates the nature of practise, preparation, waiting, failure, and non-conclusion. Rosanna graduated from BA Fine Art at Falmouth University in 2012 and is currently living and working on a residency programme in Sapporo, Japan.